MANA means either "true vegetables" 真菜 or "true fish" 真魚 (sweet water fish). In former times, all things to eat with rice like fish and vegetables were called NA no okazu 真のおかず. There are also these Chinese characters for MANAITA 俎板　俎. 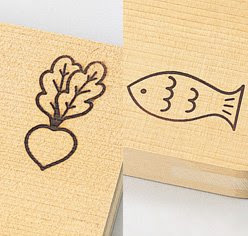 This comes from Chinese, a block where fish and vegetables were stapled before cutting. In China, it was customary to staple food on a board and present it as an offering for the gods, which were later eaten by men. Mostly made of wood, but modern ones also made of plastic. Wood must be sturdy and easy to dry, also with natural desinfectants. It should not get scratched easily by the cooking knife. For Chinese cooking a strong hard wood is necessary, often keyaki is used. to be helpless in a situation. Also called "Ita San", Mister Board. To become a sushi chef, for example, you have to undergo an exhaustive training. Sometimes it is just washing dishes and sharpening the knives and observe keenly (minarai　見習い) for two years. ryoricho, ryoorichoo　料理長　is another word for a kitchen chef. Iron Chef is a Japanese television program produced by FujiTV. The original Japanese title is Ironmen of Cooking (料理の鉄人, Ryōri no Tetsujin, Ryori no Tetsujin). The television show began airing on October 10, 1993 as an hour-and-a-half show with preliminary contests between chefs, then final battles. After 23 episodes, it was shortened to a one-hour format, dropping the preliminary contests. The show ended on September 24, 1999, but had television specials until 2002. The series aired over 300 episodes. The program has an eccentric flavor even for a game show. Its host is the flamboyant Takeshi Kaga, known on the show as Chairman Kaga (鹿賀 主宰, Kaga Shusai). Its production values are highlighted with extensive commentary made by two regular commentators and one to two guest commentators (who also serve as judges). The commentary presents thorough background information (e.g., ingredients, past history of contenders) to give a viewer context for what is happening in the kitchen; it also serves as entertainment, as friendly banter is shared among the four commentators. While always a success in Japan, Iron Chef became a surprise cult favorite in the United States when it was picked up by the Food Network and dubbed in English. Much of the U.S. appeal was due to the dubbing, which gave the show a campy charm that evoked English-dubbed Chinese kung fu movies of the 1970s. Audiences also found amusing some of the over-the-top culinary concoctions regularly featured on the show. manaita hajime 俎始 まないたはじめ "first chopping board"
A normal kitchen board is used on two sides, one for fish or meat and one for vegetables. Cucumbers are rubbed and kneaded in salt before use for some dishes. The first bonito was especially expensive for the inhabitants of Edo. Der erstenBonito der Saison, der als besonderer Leckerbissen im frühen Sommer mit Sonderschiffen von Kochi aus in die Stadt Edo gelangte, war besonders teuer. Thanks for your contributions ! over time smells rancid. I use olive oil which cleans the wood and retains its sweet smell. The board becomes more lovely with each cut, with each use. I never use this board for cutting meat -- for that I use a plastic board. Manaita Daishi 俎板大師 Daishi (carving) from a cutting board. It is about 1 meter tall. Oni no manaita 鬼の俎 / 鬼のまな板 "Devil's cutting board"
It had been said that a devil ate people after chopping them on this stone board. Oni no setchin 鬼の雪隠 "Devil's lavatory" "Demon's toilet"
It had been said that the devil relieved nature here.